Malaxa. Malaxa is a traditional Cretan mountain village, located about 15 kilometers south of the city of Chania with about 150 permanent residents. It is 450 meters above sea level and is built on the same plateau. Malaxa is accessible via the Nero Kouros village, the road to Malaxa on the slopes is very beautiful and the view to Souda Bay is magnificent. In Malaxa every year a car rally competion is held that attracts a big audience. Malaxa is a traditional village where many residents are farmers. There are many beautiful mansions, some of which have recently been restored to the original style. The village originally consisted of Ano (upper) and Kato (lower) Malaxa, the bottom part, however, is now uninhabited and there are only ruins. This section is also reachable only on foot and is probably the reason it is deserted. 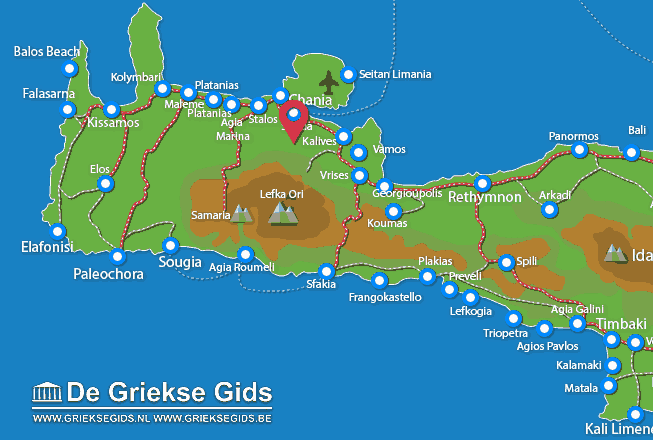 In the village are a number of tavernas serving Cretan specialties There are rooms to rent and also a hotel. In Malaxa in June 1821 there was a battle between 500 Cretans and Turks and also during the Second World War there was heavy fighting here between German paratroopers and the Greek-British forces. Five kilometers south of Malaxa lies the village Katochori, from here the gorge of Diktamos begins. In the village Nero Kouros are ruins from ancient times and there is a school museum in the old school of Nero Kouros. In this museum you can see all kinds of objects and books from Cretan history. Chania Prefecture: Where on the map is Malaxa located?